Bartlett Arch is located in the Bartlett Flats area northwest of Moab, Utah. 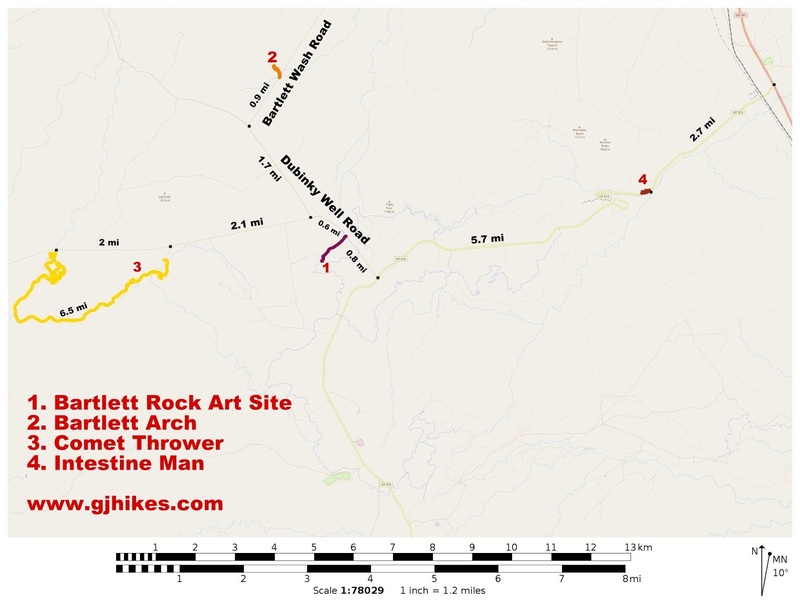 The large arch is on a wingate sandstone cliff that is just off of the Bartlett Wash Road between Dubinky Well and the Bartlett Slickrock Mountain Biking Area. When viewed from the south the prominent arch can be seen from several miles away. 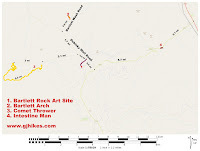 To get to Bartlett Arch drive north out of Moab on Highway 191 for about 9 miles and turn west on Highway 313 toward Dead Horse State Park and Canyonlands National Monument. Follow Highway 313 for 8.4 miles and turn right at the sign for the Lone Mesa Campground. Although there isn't a sign, this is the Dubinky Well Road. Continue for just over a mile and a half to an intersection where the Dubinky Well Road makes a right hand turn. Keep following the Dubinky Well Road for another 1.7 miles to where the Bartlett Wash Road branches off on the right. The Bartlett Wash Road is pretty rough and best suited for medium to high clearance vehicles or OHVs. It crosses a lot of slickrock that has had the high spots ground off. Since Bartlett Arch is visible from so far away there isn't any real mystery on how to get there once you get close enough to see it. To get an even closer look there is a nice flat area of slickrock to pull off on where a wash below the arch crosses the road. We wanted to get a closer look at the arch to see if there were any petroglyphs around it like there are near a few other arches that we have seen. That meant following the wash until we were close enough to cut across to the arch. That also meant scrambling up the boulder pile at the base of the cliff. We didn't notice any slithering trails in the sand but this is the kind of place where you want to pay attention and watch for snakes that might be either sunning themselves or secluded in the shade beneath the boulders. We also wanted to get close enough to see how much blue sky was visible between the arch and the cliff. As you can see, not much. There is a shelf right under the arch but no signs of any petroglyphs or campfires. Due to the curvature of the face of the cliff the blue sky gap isn't visible at all when standing directly under it. There also isn't anything special about the view of the surrounding landscape from under the arch to make the climb up to worth the effort. We wanted to check it out and get a closer look at it so for us it was mission accomplished. Though not spectacular by any means, Bartlett Arch is something to do if in the area. There are several nice primitive camping spots nearby and the road can be fun for OHVs. There is also no shortage of chert and jasper in the Bartlett Flats area if you happen to like looking for pretty rocks. We have the waypoints for every named arch in Utah loaded into our GPS so whenever we know that we are close to one we try to check it out. If you would like to see it for yourself then all you have to do is 'Take a hike'.